It’s been awhile since I’ve created a post here, and albeit for good reason (extremely busy), it isn’t exactly a good excuse. There are so many notes I take on a daily basis that I wish I would share more often. Hopefully one day I’ll have more time to convey the experiences in developing fixes and solutions for a variety of systems and scenarios. For this post, I just wanted to share something that blew my mind earlier this year. I had just passed my 2 year mark in February of 2015 and I finally went to my first “all hands” conference that Kaiser hosted for their Care Delivery Business Information Office (CD BIO). For a little background, the CD BIO is nearly 800 people strong, comprised of many different specialties. There are many other BIOs, but this is the particular one in which I’m assigned. In the first year of my employment, they didn’t do an in person meeting so I didn’t think much of it. This time everyone from out of town scheduled flights, hotels, put up out of office messages – it was a pretty big deal. The company reserved nearly two whole hotels and a fun recreation center just a few blocks away from where the convention was. To keep a long story short, I met up with all my colleagues and we were all going to sit at the same table at the conference. I never realized how big the small part of the organization that I reside in is until I saw the size of the conference hall and the sheer amount of tables it took to seat everyone. My manager found me and told me that I wasn’t going to be sitting there. At first I thought he was joking, then quickly realized he was serious. He proceeded to tell me to follow him as I was supposed to meet someone important. The person I met was the Vice President of our specific department within the CD BIO who proceeded to tell me to make sure I sat somewhere in the front row with “reserved” signs. I found my seat, luckily I ran into someone that I had worked with pleasantly over the course of the past few months so the awkwardness of being singled out was curbed a bit. Sitting through the conference, topic after topic, speaker after speaker, I just attempted to not let my mind wander to what could have been the reason of my pseudo seclusion. The topic of “Living the Mission” finally popped up on the board and I noticed the VP I met earlier head to the stage, it was pretty clear at this point, but I refused to jump to conclusions. 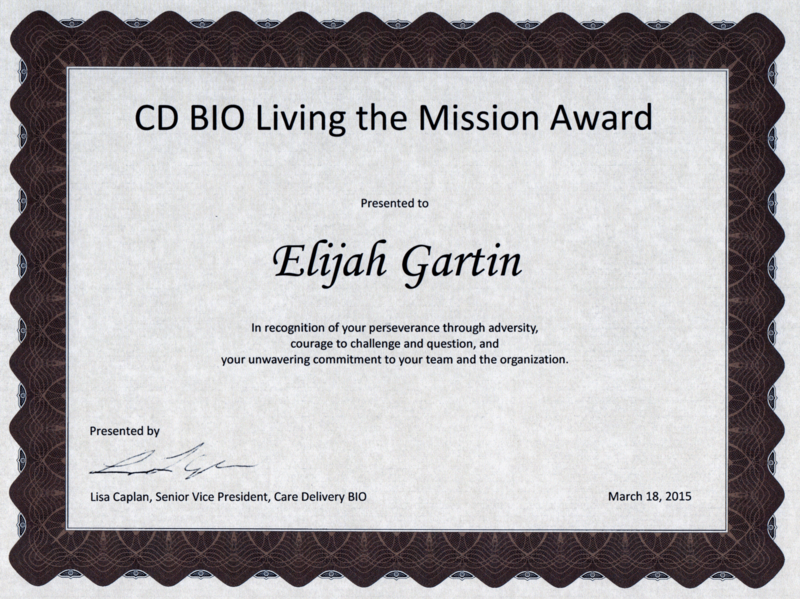 Perhaps I was awarded for my restraint in jumping to conclusions, but sure enough, the first name announced for the 2014 “Living the Mission” award goes to Elijah Gartin. I was humbled, honored, dumbfounded, nervous, happy, and the list of adjectives could go on and on. I was amazed that I was to receive an award that only about 0.5% of the employees receive each year. Figuring out how to live up to this is challenging especially through difficult times, but I’m up for the challenge. I’d like to thank all my colleagues and everyone who I’ve worked with as none of this is possible without a team. It makes it difficult for me to even accept something like this because I constantly see people who are even more deserving than myself. 2 Responses to "2014 MVP for Kaiser Permanente Care Delivery BIO"
Elijah, while your advanced abilities, character, perseverance, and determination are nothing new to your family, it’s absolutely thrilling that you and those qualities have been recognized and rewarded by such a huge and auspicious organization! OUTSTANDING!